2 FRONT + 2 REAR. 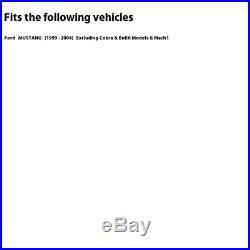 Ford MUSTANG [1999, 2000, 2001, 2002, 2003, 2004] Excluding Cobra & Bullit Models & Mach1. 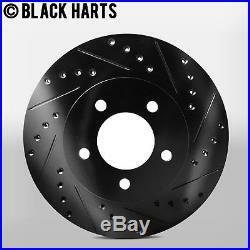 Hart brakes rotors are finished with black zinc plating which helps prevents rotors from rust, oxidation, and oxididation. Cross drilled holes help keep the rotors cooler by ventilating air through the product. Diamond slots improve the brakes system performance by wiping away the debris of used friction material. It also helps prevent the brakes pads from glazing and improves initial brakes response under wet conditions. 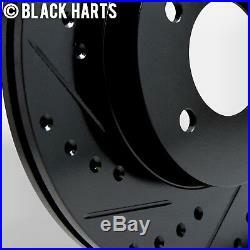 Our rotors are finished with black zinc plating. Prevents rotors from rust, oxidation, and oxididation. Please be advised that when you first receive the rotors, they will be completely zinc plated. After the initial break-in procedure where the pads come in contact with the rotor, the zinc will wear off, leaving the hat and inner vane structure silver. ARE THE PRODUCTS BRAND NEW? All of our US Direct Parts items are 100% brand new. DO YOU NEED ADDITIONAL INFORMATION ABOUT MY VEHICLE? At checkout, please include the year, make, and model. Ex: engine size (liters), 2wd, 4wd, 4 cyl or V6, turbo or non-turbo, abs or non-abs, etc. ARE THERE ANY SPECIAL MODIFICATIONS NECESSARY TO INSTALL THESE ROTORS? 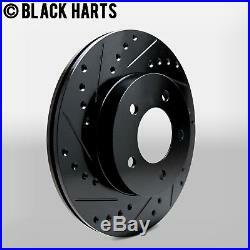 All of our brakes rotors are Original Equipment Manufecturer (OEM) spec. HOW LONG CAN I EXPECT MY NEW brakes TO LAST ME? All of our brakes parts are designed with longevity in mind, but it will depend on many different factors such as the type of vehicle you are driving, type of driver you are aggressive driver, normal driver, etc. , different outputs of your engine, or even your different driving environment. For example, a stop and go driver in traffic will have a shorter rotor life than one that drives mostly on an open highway. WILL MY ROTORS STAY COMPLETELY BLACK? When you first receive your order they will be completely black. After initial brakes-in procedure, where the pad and the rotor comes into contact, the black will wear off leaving the hub, edge, and inner vanes black. WHAT COATING DO THE ROTORS HAVE? 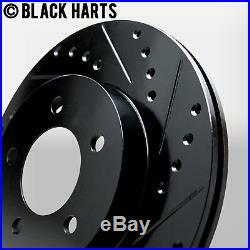 The drilled/slotted brake rotors can with silver, black, or gold zinc plating. The plain non drilled or slotted blank rotors do not come with zinc plating. The zinc coating on the brake surface will rub off after the initial bed-in period. The braking surface, the cross drills holes and/or slots if applicable can develop surface rust over time, depending on weather, climate, driving conditions, or left parked for a long extended period. Please be aware that zinc plating aide against rust but not prevent rust indefinitely. The report must include information and/or test results that prove the rotor(s) to be at warped. US Direct Parts is not responsible and will not pay for any outside cost such as storage, mechanical work or diagnostic testing. All brake pads, regardless of type or brand will have a chance to make noise. Brake pad noise does not mean the pads are bad or defective. There are many variables that can affect brake noise. Actual packaging may vary from image. ARE THE ROTORS AND PADS IMAGES THE ACTUAL ITEMS I WILL RECEIVE? Actual items can vary due to fitment specification. DO NOT confirm your fitment base on images. Please check fitment details for things such as trim, sub-models, production date, etc thoroughly to ensure proper fitment. HOW DO WE REACH YOU IF WE HAVE FURTHER QUESTIONS? But we also get customers who prefer to talk to a live professional that can help you get the right part right away. 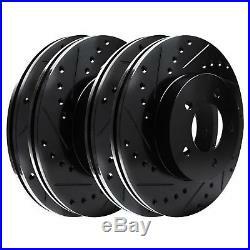 The item "2 FRONT + 2 REAR Black Hart DRILLED & SLOTTED Disc Brake Rotors C1651" is in sale since Tuesday, January 8, 2013. This item is in the category "eBay Motors\Parts & Accessories\Car & Truck Parts\Brakes & Brake Parts\Brake Component Packages". The seller is "usdirectparts" and is located in Garden Grove, California. This item can be shipped worldwide.